Terminalia chebula is generally known as Harade or Haritaki in India, it is an important medicinal plant used all over India. In English, it is commonly known as “black myrobalans”. The herb Terminalia chebula (Haritaki) consists of approx 250 species which are widely distributed in tropical areas around the world. It is used as traditional medicine and is one of the most important herbs used in Ayurveda to cure various ailments. The fruit of Terminalia chebula (Harade) is regarded as the “king of medicines” by the Tibetans and the second-to-none by Ayurveda, it also held in high esteem by practitioners of folk medicine. The herb Harade is generally used as a traditional medicine by the tribe of Tamil Nadu (India) to cure various ailments such as fever, skin diseases cough, gastroenteritis, urinary tract infection, diarrhea, candidiasis, wound infection etc, it is commonly known as ‘Kadukkaai‘ in this region. Where is Haritaki (Terminalia Chebula) Plant Found? Terminalia chebula (Harade) are found distributed in the teak forests, mixed deciduous forest, which extends in the forests of relatively dry types. It is distributed throughout tropical and subtropical Asia, including Sri Lanka, Burma, Thailand, Indochina Tibet, and southern China. It is also found in the region of Thailand and Burma along with teak. Generally, Harade plant needs lots of sunlight but withstands some shade in youth. It is a plant that can tolerant to drought and frost, can resist fire, regrowth with quick recovering from burns. In India Haritaki plant is found in the forests of northern India and region around Uttar Pradesh, Bengal, it is most commonly seen in south Maharashtra, Tamil Nadu, and Karnataka. It was also introduced to Singapore but failed, later it was successfully planted in the botanical garden in “Bogor”, later on, it was introduced in Peninsular Malaysia. How To Identify Haritaki (Harade) Plant? Plant : It is a deciduous tree with average size up to 25 m tall, with variable appearance, with a generally short cylindrical shaft of 5.10 m long, at breast height about 60-80 cm in diameter; crown rounded, with spreading branches; dark brown bark, generally longitudinally cracked with woody scales; twigs rusty-villous or glabrescent. Leaves: alternate or opposite leaves, thin-leathery, oval or elliptical-obovate, with 7-12 cm x 4-6.5 cm, rounded at the base, obtuse to subacute apex, entire, pubescent below; petiole up to 2 cm long, provided with two glands at the base of the leaf blade. Fruits: Fruit is obovoid one or oblong-ellipsoid drupe, 2.5-5 cm long, faintly 5-angular, yellow to orange-brown when ripe, glabrous. 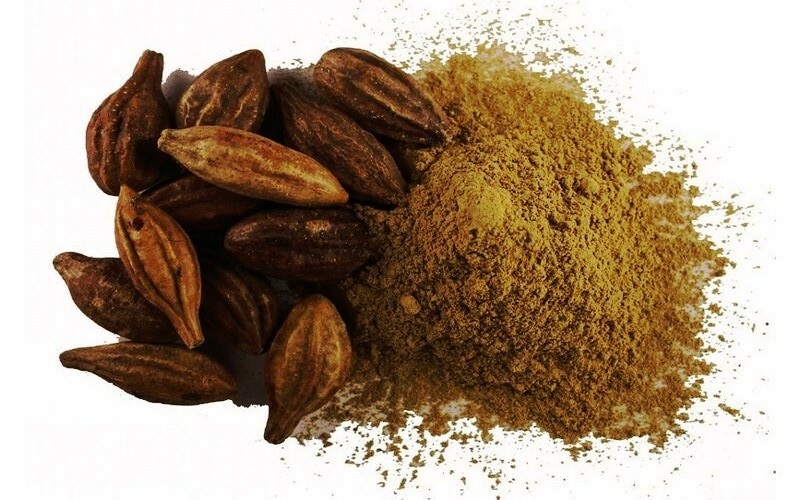 It is among the important three fruits used in “Triphala” an ayurvedic medicine which well-known name throughout the world for its health benefits. The herb haritaki is of so important for the health that the first quartet of chapters Charaka Samhita, Cikitsasthana begins with the title. The first word “Abhaya” in the term means Haritaki (Harade), beside this almost all the famous Dravyaguna Nighantu (lexicons), has a chapter entitled “Haritakyadivarga” which indicate the therapeutic importance of it among the Ved (ancient doctors of India) of Ayurveda. There are about seven varieties of this wonderful fruit mention in this section along with instructions on how to use are also widely discussed in these sections. The remedy is considered to be the best for healthy and even safe substance for the body. The Haritaki also enjoys wide patronage in Tibetan medicine known as “A-ru-ra” and praised the adjective “Sman-mchog-rgyal-pa” (the king of better medicines). The herb “Haritaki” is defined as “a fruit that is dark green-yellow, which repels disease”. It is believed that the fruit Haritaki equated with drops of nectar falling from the sky, while it was being consumed by the god “Lord Indra”. Bhavaprakasha tells this story in reverence as a dialogue between Ashivini Kumara and Daksha. In the ancient Ayurveda book, Samhitas the fruit “Haritaki” is mentioned in various groups such as. It has tremendous combination (five Rasas) of the whole fruit it is able to manage all the three doshas. Vipaka: Madhura (sweet) – Taste sweet at the end of digestion. Survari harade: They are large, dense and heavy about 2 inches long, with yellowish-brown colour, when cut it contains darkish brown or yellowish, pulp and stone. Rangari harade: These one are smaller in size, with less wrinkled and less furrowed than the above variety; in length about an inch; the epidermis is yellow; when cut it presents a yellow dried pulp and a stone. Its pulp is less astringent than that of survari harade. Bala harade: They are smaller than the above two varieties. Its color is deep brown or black, with the highly wrinkled, dark or brown epidermis. Its pulp is dark and homogenous; there is no stone. Java harade: These are the smallest of all. Other characters are similar to those of Bala harade. Rohini: Round in shape- used in Vrana, habitat in zansi and other states of India. Pootana: Size is small, mesocarp is less, the seed is bigger, externally used, habitat Sind. Amirtha: Mesocarp is more used for shodhanakarma habituate. Abhya: Fruit having five ribbed used in eye diseases, it habitate champaranya Himalaya region. Jeevantee: fruit is golden yellow, used in all diseases, habitate Himalaya. Chetaki: Fruit having three ribs, used as purgative. Halileh Zira: When the size is that of cumin seed. Halileh Javi: When the size is that of a barely corn. Halileh Zangi: When the size is of a raisin. Halileh Chini: When the fruit is somewhat hard and greenish yellow. Halileh Asfer: When it is very nearly mature. It is a wonderful herb with an antibacterial property which can be very effective in dealing with acne problems. Using Haritaki for acne is very simple, take ready-made haritaki powder which is easily available in the market or make powder from haritaki fruits, mix power with water and boiled it, soon it will become paste apply it on acne. It will not only cure acne but also prevents scarring. Beside this haritaki have the properties that can protect skin from UV rays, haritaki extract when applied on the skin will prevent skin from UV damage it is also been proven through clinical research. It is an amazing fruit that can be used for the treatment of cough for all ages it can also be safe for the children. Making remedy with haritaki for cough is very simple to make fine powder, mix it with honey and give it the person who is affected for 2 to 3 days. If you are giving this remedy to children for the first time it may vomit to its taste this is normal and no need to worry about it, he will get used to it very soon. Dose: A pinch of Haritaki powder (about 2 grams) for children around 3 to 6 years and small pinch powder (about 1 g) for children between 1 and 3 years. Note: This remedy treats coughs very effectively but does not use continuously for children without any medical supervision. Haritaki fruit is known for its properties that can remove toxins from the body and can boost the digestive system. It also helps the body in many ways such as heartburn, prevents bloating and helps in the proper assimilation of food in the stomach. Besides these properties, Haritaki is also known as a natural blood purifier that can help to eliminate toxins in the body. Regular consumption of Haritaki can regulate hunger when combined with proper diet and exercise can be the best ayurvedic medicine to lose weight naturally. Haritaki is a wonderful fruit with multiple health benefits. It has a rich source of Vitamin C and minerals like selenium, manganese, potassium, iron, and copper which is beneficial for skin. The other properties such as stearic acid tannic acid, gallic acid, palmitic acid, behenic acid, and Che bulimic acid helps to eliminate toxins from the body. So consuming haritaki can help the body internally to get your skin clean. It also helps to treat acne problems. Using Haritaki for glowing skin is simple, mix the powder haritaki with little water and make a paste out of it apply the paste on the affected area on your face. Consuming Haritaki internally or external apply both are beneficial for the body. Haritaki is one of the most important herbs of Ayurveda known to cure all stomach related problems such as indigestion, constipation, and heartburn very effectively. Consuming Haritaki can also provide vitamins-C and minerals live manganese, potassium, iron, and copper to the body. Haritaki increases mucus production in the stomach forming a protective barrier, preventing heartburn and ulcer. To deal with acidity problems take 1/4 teaspoon of haritaki powder, mixed in hot water and drink it within a week you will find the problem disappears. Haritaki is a herb with many beneficial properties it also has anti-cariogenic properties that can be useful in dealing with most of the dental related problems, especially bleeding gums and mouth ulcers. Ulcers is a problem that can affect both young and old, having mouth ulcers can be very painful as one can find difficulty in eating. The best way to use Haritaki for treatment of mouth ulcers and other dental problems is to make a mouthwash with it. To make the mouthwash, pound Haritaki fruit using a mortar and pestle; make sure that you don’t make power. Just break the outer shell. Then boil it in a cup of water, the watercolor will change to dull yellow. Now the infusion is ready to let it cools and rinse your mouth with infusion several times a day. It is the best home remedy to deal with an oral ulcer, it can give good relief. Haritaki is an amazing herb that can be helpful in treating hair loss problems. It is rich in vitamins and minerals like Vitamin C, iron, manganese, selenium, copper etc., which is helpful in hair growth. It can be used in many ways such by eating, applying powder on hair or using haritaki hair oil. Many of them use haritaki oil to prevent infection of lice and dandruff. Using it on a daily basis can make hair thicker, black and long. How to use: Take a cup of coconut oil in a pan and add 3 haritaki pods and heat it. Once it turns brown, with outer shell cracks turn off the flame, let it be cool and store in a glass bottle. Apply this oil regularly to prevent dandruff and lice infection. Many suffer from constipation and gas for this they take some medicines on a regular bases. Regularly taking medications for constipation can make a person dependent on them, of course, the side effects of bloating and flatulence is also created. Haritaki powder has a natural laxative property that can be helpful to those people to solve this problem. Regular consumption of natural laxatives like haritaki can benefit in constipation and it is also rich in fiber that can benefit the overall health. Making remedy for constipation is very easy to keep the haritaki fruit in the sun when it is well dried make a powder of haritaki fruit. Grind them in very fine particles and store the powder in a bottle. Take half to one teaspoon of the powder in a bowl, add boiling water to it and drink when it is a little warm before going to bed. You will find the changes in your health within a week. Diabetes has become a major and general health problem throughout the world and it is growing at greater speed. Usually, medication used for diabetes also causes some side effects. There are a variety of tasks required to reduce diabetes such as eating a healthy diet, exercise, and other precaution. Consuming 1 tea spoon of Haritaki powder with a little honey daily in the morning can help to control diabetes Ref. (Astanga Sangraha Chikitsa Stahna, 14/5). Note: Please do consult your doctor and take advice if you are already taking medicines for diabetes. Haritaki have been successfully used to treat various skin disorders associated with allergies, urticaria (hives), skin rash and other problems related to skin. It can also be very beneficial for skin allergic that is cause by wearing artificial jewellery. Haritaki have natural antibacterial properties that can help in disinfecting wounds, treat acne and promote restoration of damaged tissues. How to use: Take one cup of boiling water; mix half a teaspoon of powder Haritaki in it. Mix it properly then apply the paste on the effected skin, leave for a few minutes and rinse. Haritaki is possibly safe when taken orally for 3 months or less, don’t use it without medical supervision for long time as it might affect your heart. Pregnancy: Some evidence has been found that using Haritaki is possibly unsafe during pregnancy. So it is best to avoid using it. Breast-feeding: No such evidence or information found on breast-feeding but for safe side avoid it. Diabetes: Use of Haritaki might lower blood sugar levels but need to consult doctor about taking along with diabetes medications. Surgery: Haritaki might decrease blood sugar levels, can interfere with blood sugar control during surgery. Stop taking Terminalia at least 2 weeks before a scheduled surgery. So dose it really work? apple cider vinegar & White vinegar? Great information, will try this to use.